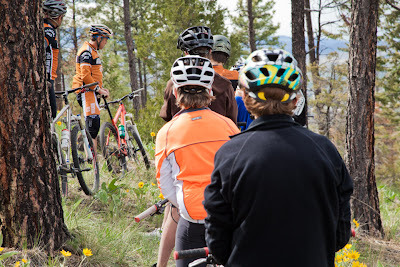 I had the opportunity to go to Helena to photograph and ride a little trail with Geoff Proctor and the Helena Dynamos. 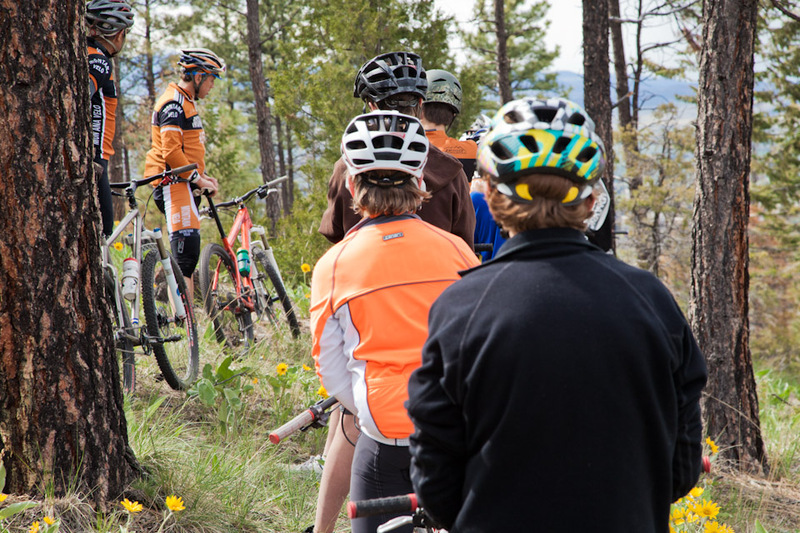 The Dynamos are the largest youth cycling program in the state, and hosts weekly training rides every Friday after school from April through September. Below is a note from Geoff talking a bit about the program and how the day went. We were honored to have Missoula dignitaries Jed Dennison, Tom Roberston, and Troy Kindred here last Friday for Dynamos training. The thinking behind our invitation was to share what we do here in Helena to perhaps ignite something similar in Missoula (and, ultimately, other Montana cities and towns). We had a ton of fun with Jed riding along with Scott Herzig's beginner group, Troy shredding with one of the intermediate groups, and Tom accompanying me with the advanced group. Despite it being the Friday of a three-day Memorial Day weekend, we still had 43 riders and some 12 ride leaders/parents. The skill of the day was review of switch-back technique and, as is the custom, there were Jelly Belly Sport Beans for all participants (compliments of pro friend Jeremy Powers). At several points, we shared some of the challenges to getting kids on bikes--from forms we have the kids fill out to how we instruct them when riding through town, from scheduling trail work days to outlining goals of the program. Two principles include working directly through the schools via ride leaders who share an interest in cycling and the objective of creating a broad-based pyramid to establish a pool of riders from which to encourage racing. 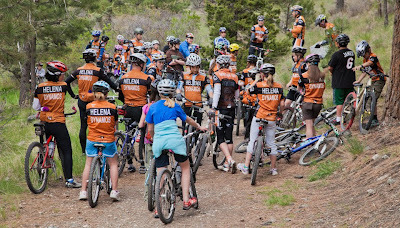 At this point, we have several Dynamos qualified for Sun Valley MTB Nationals and hope to bring a bunch to Missoula XC as well. 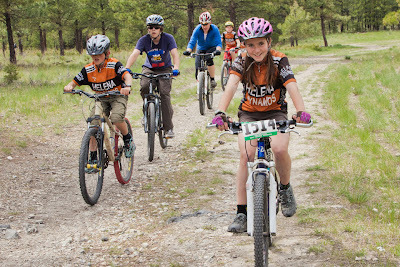 I will say that it is quite impressive to see that many kids on mountain bikes on the trail. 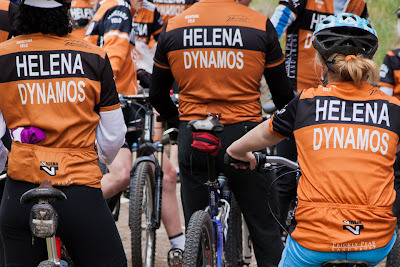 And especially to see so many decked out in a Helena Dynamos jersey. 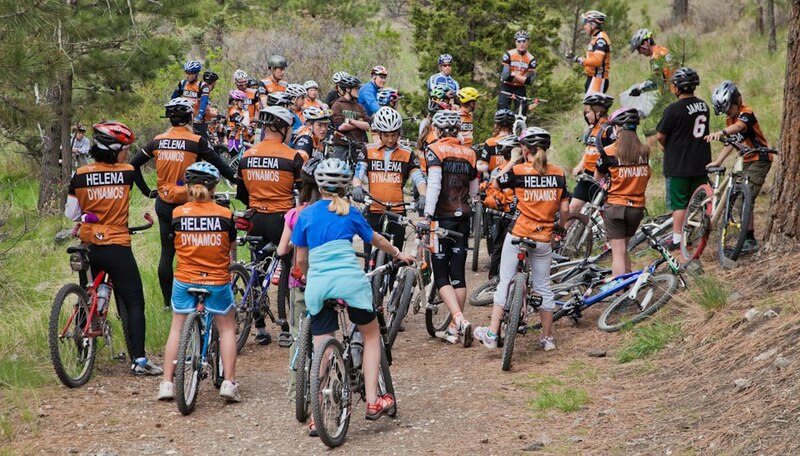 In the next few weeks a group of the Dynamos will make the trip over to Missoula to ride the race course at Marshall. There are a number of them that plan on racing in July. Here is a link to more images from the day.